The annual list of Fortune 500 companies highlights the best and most profitable corporations in the U.S. The list debuted in 1955 when Edgar P. Smith considered a way to measure the vitality of the U.S. economy. Today, the rankings are based on companies' total revenue for the year. Fortune 500 helps consumers and stockholders understand which companies are outpacing their competition and which companies are experiencing lower revenues. Rising to the top of a Fortune 500 company takes hard work and rigorous academic preparation. Consequently, a quality education is important to any student interested in becoming a modern business leader. Several colleges and universities stand out for producing a high number of CEOs and prominent businesspeople. The following list describes where current Fortune 500 CEOs earned their degrees. Students at these schools can network with successful alumni and use their school's business connections to find jobs. The following list is based on analyses of the 2017 Fortune 500 and the biographies of the CEOs who head each company. 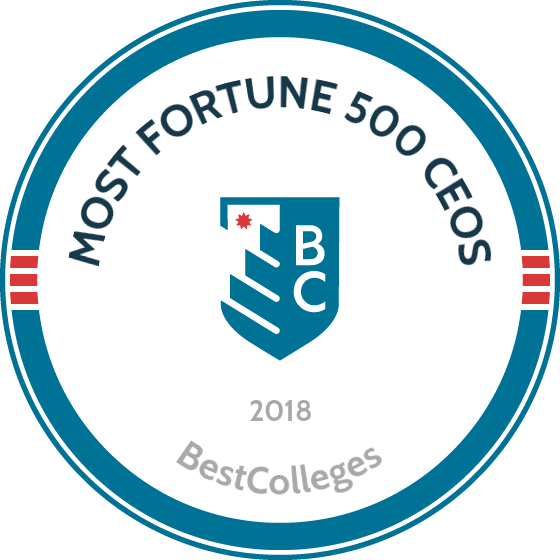 Using this data, BestColleges.com determined which colleges and universities educated the most Fortune 500 CEOs. The list below is in rank order. The profiles explain how and why these schools consistently attract standout students who go on to take top jobs at some of the world's leading corporations. Established in 1876, Texas A&M University is a flagship research university with global influence and reputational standing. The school's success in preparing future leaders is unquestionable: four of the CEOs on the Fortune 500 list are alumni. Notable CEOs include Darren Woods, who heads Exxon Mobil, and David Cordani, who heads Cigna. Texas A&M offers 130 undergraduate programs, 170 master's programs, and 100 doctoral programs. Current students of the business school can receive guidance, job opportunities, and advice from the close-knit alumni community of 62,000 business professionals. The university's commitment to lead by example is evident through its "Vision 2020: Creating a Culture of Excellence." The strategy identifies 12 areas of focus that have guided the university since 1999. Texas A&M's business school has received recognition from Bloomberg, CEO magazine, Financial Times, Princeton Review, Forbes, and U.S. News & World Report. The University of Michigan stands out as one of the top universities in the nation for both academics and alumni success. Alumni Tom Wilson of the Allstate Corporation, Timothy Sloan of Wells Fargo & Company, Larry Page of Alphabet, and Jim Hackett of Ford all claim a spot on the Fortune 500 list. Other famous alumni include President Gerald Ford, JetBlue founder and CEO David Barger, Photoshop creator Thomas Knoll, and Boston Consulting Group CEO Rich Lesser. U-M promotes ongoing research initiatives, an affinity for the arts, and strong academic values. U-M's schools and colleges include architecture, engineering, law, nursing, and public policy. The number of students applying for freshman admission has been on the upswing since 2007, more than doubling from 27,000 applicants to nearly 60,000. Ninety-eight percent of MBA recipients receive a job offer within three months of graduation. Located in Cambridge, Massachusetts, Harvard University maintains its reputation as one of the most prestigious schools in the world. Founded in 1636, Harvard is the country's oldest institution of higher learning. Notable CEO alumni include Lloyd Blankfein of Goldman Sachs, Michael Corbat of Citigroup, and Kendall Powell of General Mills. In addition to Fortune 500 CEOs, Harvard is the alma mater of eight U.S. presidents and more than 60 billionaires. With 20,000 current students, the university boasts an alumni network of more than 360,000 professionals around the globe. Part of the private Ivy League group of universities, Harvard requires applicants to undergo a rigorous admission process. The university takes its name from John Harvard, a clergyman and graduate of the University of Cambridge who bequeathed the school with money and approximately 400 volumes from his library. Harvard ensures that 100% of its students graduate with no student debt. Cornell University is a private Ivy League institution that prides itself on discovery, engagement, and learning. Located in Ithaca, New York, Cornell sits on over 2,000 acres in the picturesque Finger Lakes region. The school produced several CEOs currently on the Fortune 500 list, including James S. Tisch of Loews and Irene Rosenfeld of Mondelez International (formerly Kraft Foods). Cornell's mission is to educate global citizens, improve lives around the world, and preserve key knowledge. In addition to its attention to academic achievement, Cornell values intellectual potential, sound character, and community involvement. Business students can attend Cornell's graduate school of management, the school of industrial and labor relations, or the school of hotel administration. Forty-five Nobel laureates are associated with the school. Cornell also maintains locations in Rome, Qatar, New York City, and Washington, D.C. Established in 1764 in Providence, Rhode Island, Brown University is a member of the elite Ivy League. The university is the seventh-oldest institution of higher learning in the U.S. and ranks among the top research institutions in the world. Home to a diverse community of over 6,500 learners, Brown educated many CEOs on the Fortune 500 list, including Bank of America CEO Brian Moynihan. The university offers 81 areas of concentration, including options in cognitive neuroscience and Egyptology. Students design their own program of study with the help of a faculty advisor. Business students can take courses in economics or business, entrepreneurship, and organizations. These programs focus on the creation and management of new ventures. Brown also hosts a respected MBA program. The school accepted fewer than one in 10 applicants in 2017, with 2,654 out of 28,919 candidates admitted. Established in 1855 as the nation's pioneer land-grant university, Michigan State University maintains one of the largest, greenest campuses in the country. MSU ranks as one of the world's leading research universities, with current research in computation, education, arts, and international affairs. Business students at the school conduct research into sales, supply chains, taxation, diversity in work groups, and the economy. With several alumni on the Fortune 500 list, including Home Depot CEO Craig Menear, MSU hosts a particularly successful business school. MSU offers more than 200 undergraduate, graduate, and professional programs to 560,000 students around the globe. Business students can choose from programs such as risk management, finance, and management. On average, students accepted to MSU hold a high school GPA of 3.5 to 3.9, SAT scores from 1120 to 1290, and ACT scores from 23 to 28. Focused on innovation and intellectual growth, Northwestern University educates 21,000 learners through 12 schools and colleges. With two locations in Illinois and a location in Qatar, Northwestern maintains global standing as one of the world's premier research universities. The school counts Fortune 500 CEOs among its list of notable graduates, including IBM CEO Ginni Rometty, who became the first woman to lead the company. Northwestern leads global engagement opportunities in 50 countries. Students can participate in study abroad, global alumni networks, and international research initiatives. Approximately 90% of Northwestern University applicants rank in the top 10% of their high school class. The school's enrollment of National Merit scholars is among the nation's highest. The university accepts new students and transfer students who have completed at least one year of full-time undergraduate studies. Pennsylvania State University is a public research institution with 24 campuses, 100,000 students, and 17,000 faculty and staff. With unquestionable reach and global standing, it is no wonder the school counts many Fortune 500 CEOs among its alumni. Alumnus Mark Parker helms Nike, which ranked number 88 on the Fortune 500 list in 2017. Penn State maintains a strong online presence, with 150 programs available to distance learners. Even through its online campus, Penn State holds true to values of respect, integrity, excellence, and responsibility. Enrollment in the university requires a well-rounded high school education that includes a foreign language. Admission is a rigorous process: Over 77,000 individuals applied for the freshman class in 2017, with only 21,000 admitted. Nearly one in five applicants was from outside the U.S.
Amazon founder and richest man in the world Jeff Bezos is among Princeton University's most notable alumni. Bezos graduated from the Ivy League institution in 1986 with undergraduate degrees in electrical engineering and computer science. He is one of two current Fortune 500 CEO graduates from the school. Princeton prides itself on outstanding academics coupled with a spirit of service. The school's mission is to help students and alumni leverage their education to make a meaningful difference in the world. Established in 1896, Princeton is reputed for its rich intellectual environment. A top-rated university with just over 5,000 undergraduate students and 1,200 faculty, Princeton maintains a student-to-faculty ratio of just 5-to-1. The school was a leader among universities when it replaced student loans with grants that students do not repay. Today, nearly one in six Princeton students receive some type of financial aid. Both Berkshire Hathaway CEO Warren Buffet and Tesla CEO Elon Musk attended the University of Pennsylvania. An Ivy League institution located in the heart of Philadelphia, the school demonstrates a commitment to academic excellence, inclusion, and community engagement. Penn hosts more than 6.5 million volumes in multiple libraries across its campus. More than 165 research centers and institutes operate on campus. Founded in 1740 by Benjamin Franklin, the University of Pennsylvania prides itself on the diversity of its students. Nearly half of students in the class of 2021 represent ethnic and racial minorities. The university's nearly 10,500 undergraduates enjoy a student-to-faculty of just six-to-one, leading to ample opportunities for personalized instruction and collaboration. More than 40,000 individuals applied for freshman admission in fall 2017, but the university accepted only 3,700 students. A globally renowned university located California, Stanford University prides itself as a hub of discovery, innovation, and expression. The school opened in 1891 in memory of state senator Leland Stanford's only child. With more than 16,000 students and 2,100 faculty, the university offers learners the opportunity to major in more than 65 fields of study. Stanford maintains a student-to-faculty ratio of just 4-to-1, one of the lowest in the nation. One of the university's most notable graduates is Fortune 500 CEO Reed Hastings, who co-founded Netflix. Other notable alumni include President Herbert Hoover, Gap founder Doris Fisher, Time Warner CEO Jeffrey Bewkes, and Instagram founders Mike Krieger and Kevin Systrom. Of the 44,000 applicants for the class of 2021, the university accepted just over 2,000, with 1,700 ultimately enrolled. Two notable alumni from the University of North Carolina at Charlotte serve as CEOs of Fortune 500 companies: Robert Niblock of Lowes Companies and Joseph Swedish of Anthem. UNC Charlotte was founded just after World War II in response to the workforce demands the war had generated. The school features more than 30 on-campus business partners. Students can also find internship and employment opportunities in the business-friendly city, including at the Bank of America headquarters. Students may choose from 170 undergraduate programs and 140 graduate programs. Business students can study accounting, international business, business analytics, management, marketing, and others. University partners include Allegro, Vivid Data Group, NC Biotechnology Center, and Soymeds. The university allocates $50 million each year for research initiatives. The federal government has issued more than 200 patents to UNC Charlotte. A world-renowned institution located in New Haven, Connecticut, Yale University is one of eight schools in the prestigious Ivy League. Since 1701, the university has encouraged innovation, discovery, and creation of knowledge. Yale's liberal arts curriculum promotes critical thinking and intellectual curiosity. Students enrolled in graduate and professional schools enjoy access to career-building opportunities. Notable Fortune 500 alumni include Indra Nooyi of PepsiCo., who earned a master's degree at the Yale School of Management. A member of the Global Network for Advanced Management, Yale's management school focuses on global business and education. Yale houses 15 million library holdings, offers 35 varsity sports teams, and hosts nearly 300 student organizations. Admission to Yale is highly competitive; the university's undergraduate population totaled just 5,400 students in fall 2016. Learners hail from 118 countries. Founded in 1871, the University of Arkansas began with just eight students on a hilltop campus in the Ozark Mountains. Nearly a century and a half later, the school's student body represents 50 states and 120 countries. The university follows a students-first policy, ensuring all learners receive a quality attention and personal attention. Among the school's most well-known graduates is Doug McMillon, CEO of Fortune 500 company Walmart. McMillon earned his bachelor's degree in business administration in 1989. The university offers 85 bachelor's programs, 95 master's programs, and 50 doctorate programs. Undergraduates who excel academically may join the school's honors college, which provides special housing and increased access to faculty. Learners who want to deepen their understanding of foreign cultures can choose to study abroad, including at the university's Rome center located a short distance from the Vatican. Auburn University was founded as East Alabama Male College in 1856. The school became the first land-grant college in the South in 1872 and assumed its current name in 1960. Situated on nearly 2,000 acres, the Auburn campus houses more than 400 buildings, about half of which are for teaching and learning. Tim Cook, CEO of Fortune 500 company Apple, is an Auburn graduate, having earned a bachelor's degree in industrial engineering in 1982. With a total enrollment of about 30,000 students, Auburn hosts a global population of diverse, forward-thinking learners. Nearly 1,000 students come from other countries. Undergraduate students can choose from more than 140 majors. Business majors can select from programs such as accountancy, business analytics, international business, marketing, and professional flight management. The school makes significant contributions to the Alabama economy through its investments, business transactions, and the Economic Development Institute. Number of Fortune 500 CEOs: This represents the total number of men and women who earned either an undergraduate or graduate-level degree from the school at some point prior to September 2013. Number of Degrees: This figure represents the number of degrees conferred to Fortune 500 CEOs prior to September 2013; if this number exceeds the number of CEOs, then it should be assumed that at least one Fortune 500 executive has earned multiple degrees from that college or university. Combined Gross Annual Revenue (in billions): This figure represents the total earnings of all Fortune 500 companies represented by CEOs who earned a degree from the given school. The amount is expressed in billions of dollars. Each entry on our list of 38 is accompanied by a short blurb about the school that includes information from U.S. News & World Report, one of the most authoritative sources of comprehensive college rankings; the site uses a myriad of data points ― including cost of tuition, student outcomes, and student-to-faculty ratio ― to derive its annual 'best of' lists. We consulted two USNWR lists in particular for this list: the site's 2013 rankings of national universities and best business schools in the country. To ensure our list remains somewhat objective, we have chosen not to list specific company or executive names.